How do you live to be 100? In the North of Sardinia we know! A recent report by CNN unveiled the centenarians’ longevity secrets in Sardinia, one of the 5 Blue Zones in the world, along with Okinawa (Japan), Nicoya (Costa Rica), Ikaria (Greece) and Loma Linda (California). When the scientists Pes and Poulain identified the lifestyle habits of people who live in the so-called Blue Zones, those parts of the world where people live longer than the average, they listed a number of factors that we here in Gallura know very well. The researchers identified good food as being one of the most important factors for living to be 100. For 25 years our hotels have dedicated themselves to Mediterranean cuisine and the authenticity of their ingredients. In our restaurants we make a point of using 0 km products and we are constantly looking for excellence in the food that the area has to offer. At the Resort Le Dune at Badesi for example an organic vegetable garden and an aviary with free-range hens provide fresh eggs and vegetables every day which are used in the children’s restaurant and the bottle-preparation facility. At the Carrimbanca Restaurant the suckling piglet is roasted according to tradition and the meat arrives straight from the farms in and around Aggius. At the Resort Valle dell’Erica you can enjoy typical dishes in the Li Ciusoni Sardinian restaurant where Chicca, our housewife-cook extraordinaire not only prepares the pasta by hand but also gives lessons in traditional cooking. In addition to the freshness of the products, the researchers also stress the importance of eating lightly and that’s exactly what the Delphina Mediterranean Brunch is! It’s a light and refreshing lunch offering a varied buffet with pasta dishes, vegetables, salads and fresh seasonal fruit so that you can eat well but sparingly and still enjoy days by the sea. In the “diet” followed by people in the Blue Zones, wine seems to be an essential ingredient if consumed moderately but regularly. And if a glass of wine a day is good, then Sardinian Cannonau is extremely good. It has been shown that this particular grape variety which is typical of our island, has between 5 and 10 times more natural antioxidants known as polyphenols than any other parts of the world. And there is no lack of good wine to go with the good food at our hotels! In addition to offering some of the most renowned national and international labels, our President has selected some of the island’s best wines for our guests, offered exclusively by Delphina and including INNITU Cannonau. 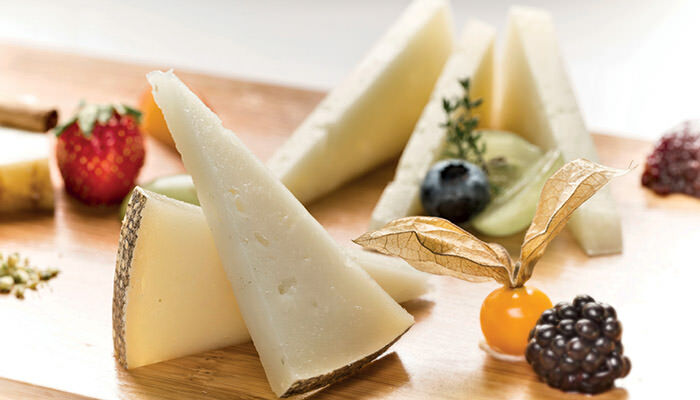 What’s more, so that you can enjoy the flavours and tastes of Sardinia once you get home, we have selected a number of excellent products including spices, jams, pane carasau (music paper bread), bottarga, herbal teas, Mirto liqueur and wines that our guests can buy and take home with them. Another key ingredient in the recipe for long life is movement and activity. 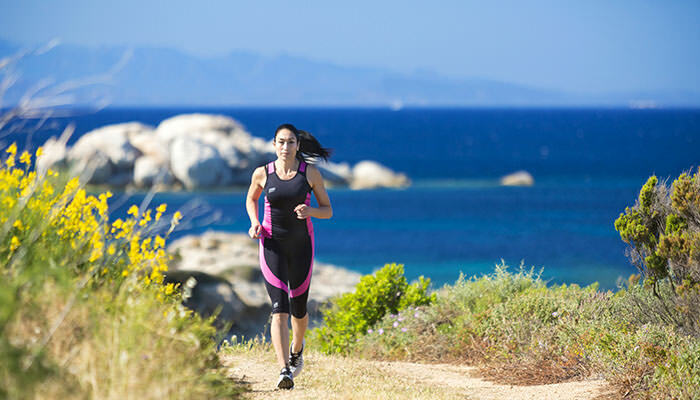 Many centenarians have not spent even a day away from nature and outdoor activities and here in Gallura the natural setting offers breathtaking landscapes and wonderful walking routes. From the footpaths from Capo Testa to Santa Teresa Gallura to those of the Costa Paradiso, trekking on the North Coast of Sardinia is an experience not to be missed. But even gentle training on the nature trail of the Resort Valle dell’Erica is a good way to start the day. However it is impossible not to go and explore the roads of the inland areas. We at Delphina are keen that our guests discover the authentic Gallura and therefore we have organized numerous excursions for you to discover the typical granite villages and inland countryside filled with flowers. From the Valley of the Moon at Aggius to the archaeological complex at Arzachena, walking in the open rosemary-scented air between pastures and old shepherd’s huts will allow you to experience the real deep-down value of the island. Time in Sardinia is marked by slow rhythms, the rhythms of nature and the sea breeze. As the centenarians tell us, a stress-free life is a long life. And what better moment to get rid of the tensions of a year of work than during a holiday by the sea? Just enjoy the flame-red sunset over the Costa Rossa from the veranda of your room at the Hotel Marinedda or the Hotel Torreruja and clear your mind of every negative thought. We built the best rooms with the intention of giving you the most beautiful scenery that the North of Sardinia can offer. 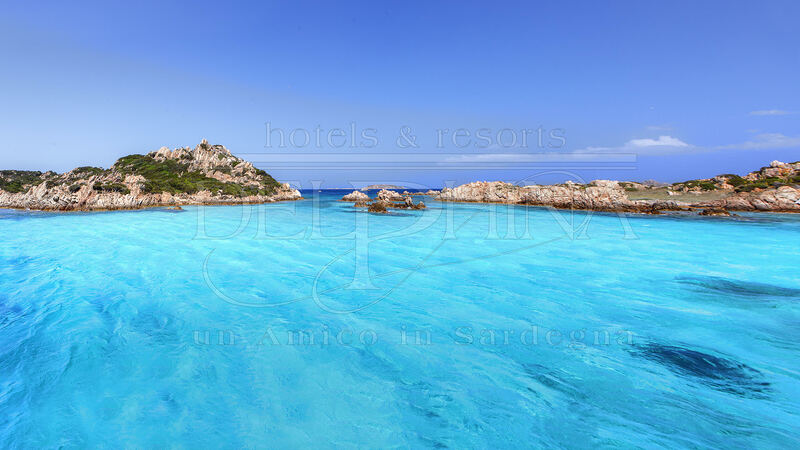 But as well as Blue zones, here in Sardinia we can also boast a stunning and endlessly transparent blue sea. Scientific research in Wallace J. Nicholas’ book Blue Mind points out that contact with water and the colour blue can make us happier. Delphina has made the sea its faithful ally and partner by creating the best thalassotherapy centres in Sardinia. In the Delphina Thalasso & SPA centres from Palau to Isola Rossa, seawater (taken from the sea in accordance with strict protocols) is heated to different temperatures in multi-function pools surrounded by lush Mediterranean vegetation. 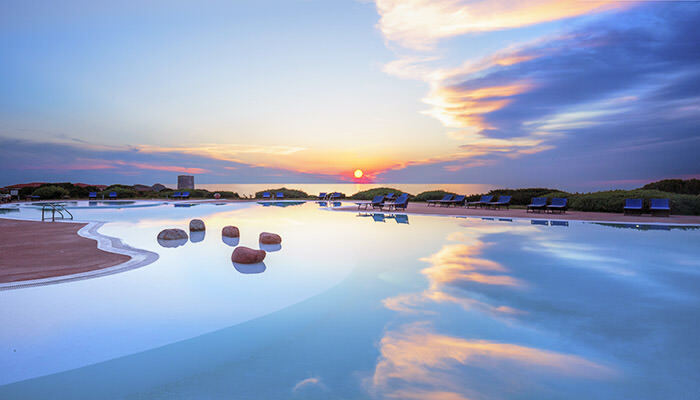 We have created oases of peace and harmony to give guests the benefits that only the god Poseidon can grant. But we have also collected gifts from the earth for our beauty products: myrtle, lemon and Cannonau grapes are just some of the ingredients used in the organic treatments available at these prestigious SPAs. Recently none other than the famous French brand Chanel was inspired by the Blue Zone and essences of Sardinia. In addition to coffee from Costa Rica and mastic from Greece, the new facial cosmetics serum called (not surprisingly) Blue Serum also contains olives from Bosa, a small coastal town on the island. We at Delphina are a Gallura DOC family, always and constantly united in expressing and passing on our 5 star Sardinian culture to all those friends who want to spend their holidays in the North of Sardinia. We have chosen to develop and enhance the entire Gallura coastline from the Costa Smeralda to Badesi because this is our home! And as claimed by scientists and researchers, even the family as a reference point together with active participation in the community guarantee a longer life. All Delphina’s friends know that spending holidays in one of the eight jewel-like hotels in the collection doesn’t mean just enjoying the sea and relaxing in the best hotels in Sardinia, it also means above all enjoying a unique and authentic experience, discovering the real Sardinian soul and the genuine beauty that the island has to offer. With Delphina hotels and resorts we’re not talking about the usual holiday. Every moment is a unique opportunity to try out the healthy and harmonious Sardinian lifestyle, behind which lie the secrets of longevity. The value of hospitality is in the DNA of us Sardinians. If you choose Delphina, you will have a friend in Sardinia waiting for you!